As Christmas approaches it is the perfect time to take a look at our loved ones and their interests. 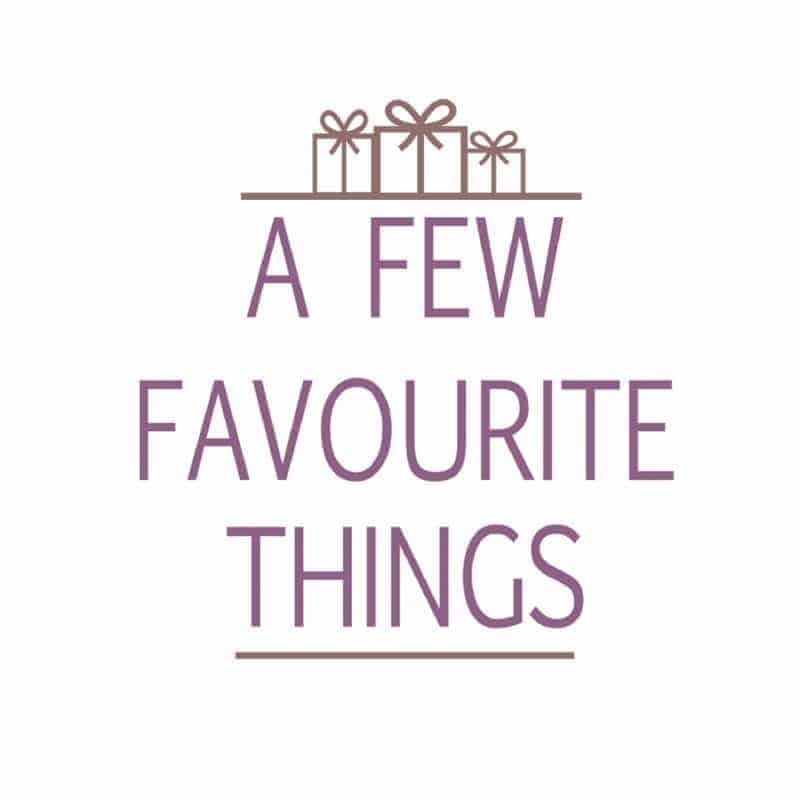 When it comes to selecting that perfect gift for Christmas, why not make it one that they will truly love. The Wizard of Oz film was released back in 1939. Some 77 years later it is still watched by millions whenever it is shown on TV. For some the magic of the Wizard of Oz continues within their hearts and they love all the merchandise that has been produced. 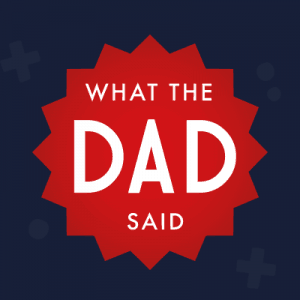 So if you know a Wizard of Oz fan (I’m looking at you Magic Nanny), then take a look at my five Wizard of Oz themed gift ideas. If you are looking for that statement Wizard of Oz piece, then look now further than the Wizard of Oz Glittered Print. From the amazing debono & bennett, two beautiful ladies who have a wonderful collection of original hand illustrated prints. The quirky glittered print is inspired by the darker side of the Brothers Grim. 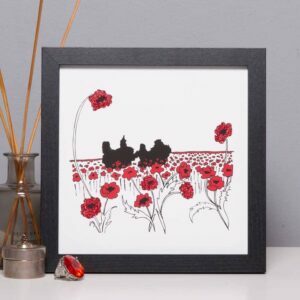 Featuring Dorothy, Tin Man, Scarecrow and the Cowardly Lion as they make their way across the famous poppy fields. Available from Not On The High Street, priced at £29.99 – which is an absolute steal for a beautifully designed and printed item that is framed too. 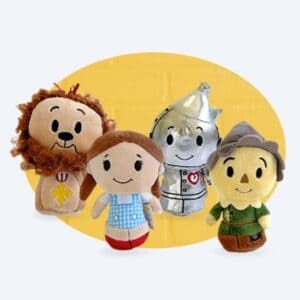 Fans you and old will love the Wizard of Oz Itty Bittys collection from Hallmark. Available in a choice of four characters; Dorothy, Tin Man, Scarecrow and Cowardly Lion as well as two Limited Edition characters; Wicked Witch of the West and Glinda the Good Witch. Available to purchase individually so you can purchase their favourite character. Or collect them all until you have the full set. 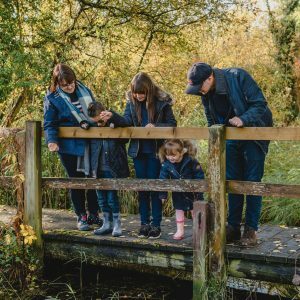 Whether they are a decorative feature standing proudly on a shelf with other Wizard of Oz memorabilia or whether they will be used to act out the story line on a homemade yellow brick road. Available to buy from Amazon, with prices starting at £6.00, they make the perfect stocking filler for all the family. When it comes to Wizard of Oz accessories, you are usually limited to t-shirts or tote bags. However, the fabulous Rio from Literary Emporium has produced a range of literary inspired accessories. 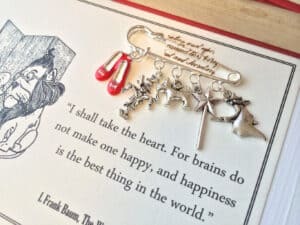 The Wonderful Wizard Of Oz Brooch which is sure to receive comments and compliments whenever it is worn. The quirky brooch features the iconic ruby slippers, the scarecrow, Toto the dog, Glinda’s wand and the Wicked Witch of the West. 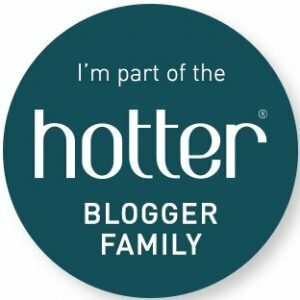 Available from Not On The High Street, priced at £18.00 – which is an amazing price for a brooch, nevermind one that is themed towards the Wizard of Oz. Something that every Wizard of Oz fan would adore has to be a pair of Ruby Slippers. Whilst red glittery shoes seem to be available for children, who says that only children want them? 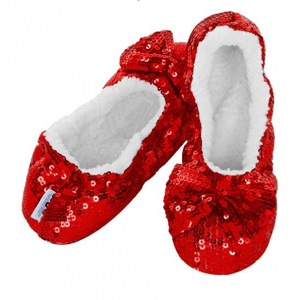 Snoozies have produced some Red Ballerina Ruby Slippers, perfect for grown-ups who would still love to own and wear a pair of ruby slippers. Perfect for wearing around the house instead of traditional slippers, see if you can catch them clicking their heels together. Available to buy from Amazon in three different sizes; UK 3-4, UK 5-6, and UK 6-7. Prices start from £9.99, which personally I feel is worth it just for the pure novelty factor of having a pair of ruby slippers. Adding a special poster on the wall that will cause a talking point, one that will be inspected by everyone who happens to walk past it. This is what the amazing Spineless Classics have created within The Wonderful Wizard of Oz book text poster. 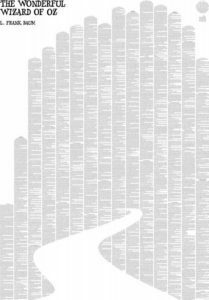 These astonishing posters include the entire Wizard of Oz novel written on one poster. Cleverly written around the design of the yellow brick road outline. Everyone will be sure to take a look and ask in amazement whether that is the entire novel written. Available direct from Spineless Classics, priced at £34.99 for an unframed poster – a beautiful piece that would look amazing hung above a desk, at the top of the stairs or in the hallway. that I feel every Wizard of Oz fan would love. Just wow! I started with thinking I *must* get that pin. Then thinking “yes” the slippers are in my size- but then, that text poster is a thing of beauty. Decisions! A great list.